Whether you are pitching your idea to an investor, creating a sales video, sharing on a conference panel, or launching a keynote your ability to speak with comfort and confidence about your business or organization is an important skill to have. 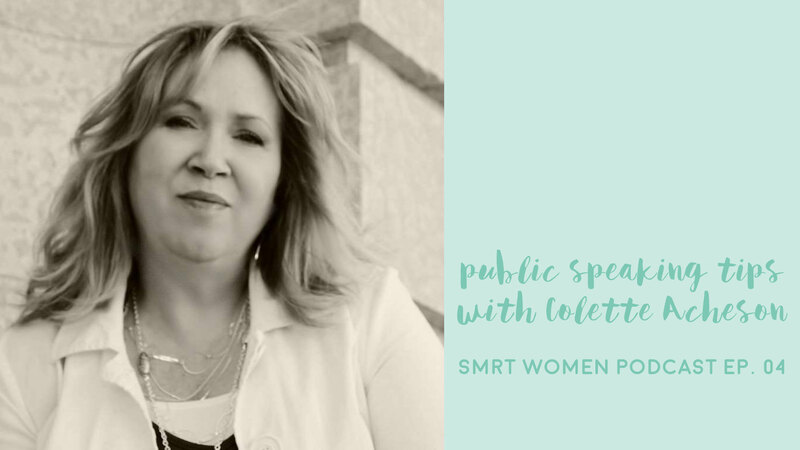 In episode 4 of the SMRT Women podcast we sit down with Colette Acheson, local management consultant to talk all things public speaking. Colette is a business owner and non-profit manager several times over. She has honed her public speaking skills in the trenches and in Toastmasters meetings. The only way to get better is to just do it. Practice in front of a mirror, video tape yourself, practice for your friends - but know that no amount of practice except the actual act of speaking in public will be practice to get you more comfortable and more experienced. Welcome and invite any opportunity no matter how small to flex your public speaking muscles. Pick one thing you want to work on - removing your ums and ahs, working with your voice, figuring out how to hold your hands - and focus on it. Take every failure as a learning opportunity. When you speak your whole body is communicating. Take the time to explore how you stand and gesture with your body to communicate emphasis, but also pay attention to your voice and your jaw. Give them a proper warm up before you ask them to run a marathon. Take a deep breath before you begin. Slow your body down. Take a deep breath between parts of your speech - give your audience a moment to catch up - to let your words sink in. It feels like a million years up there when all eyes are on you, but it’s a short second for the audience and a welcome one. What does your audience need to feel and connect with to believe your credibility? Do they want to be entertained? How can you work with voice, presence and posture, language and storytelling to convey that and get the message across. Are you connecting? It’s important to learn to listen and observe as you speak so you can shift and pivot to keep the audience’s attention as you work through your presentation.